Indian Institute of Technology, Kanpur has advertised in THE TIMES OF INDIA newspaper for the recruitment of Teaching Faculty- Professor / Associate Professor / Assistant Professor jobs vacancies. Interested and eligible job aspirants are requested to apply on or before 31st August 2018. Check out further more details below. Various Departments. Visit official website for details. 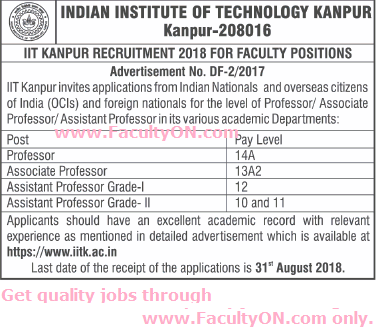 Reference: Advertisement from Indian Institute of Technology Kanpur on THE TIMES OF INDIA newspaper dated 18th July 2018 for the recruitment of vacancy position such as Professor / Associate Professor / Assistant Professor faculty jobs. See the copy of advt below.